Best Friends come into our lives and leave Paw Prints all over our hearts. Many pet parents don’t consider their pets as pets but rather members of the family. Treating and spoiling them like children is a testament to the relationship between humans and pets. When you lose a pet, it is like losing family member. National Pet Memorial day is a day to celebrate all pets past and present and to bring closure to the departure of our loved ones. Here are a couple ideas to celebrate your late pet’s life and the impact they had on yours! Plant a tree – Pick a nice shady spot in your backyard or in your local community and plant a tree or shrub in their honor. If they had a special or favorite spot in the house, commemorate it with a house plant. If they liked the yard, create a special healing garden memorial and build a bench like this one to really make it a special project. Help animals in need – Shelters and rescue centers are always looking for extra volunteers and donations. Find your local shelter and donate towels, food and toys. It might be too soon or hard to adopt but helping to volunteer on adoption days to help other animals find forever homes. Who knows, you might even fall in love with another fur ball. 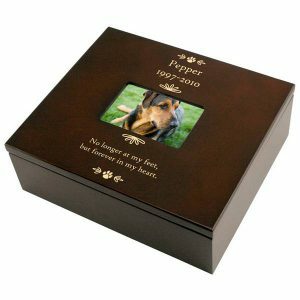 Memorial Frames/Keepsake box – Do you have a favorite photo of your beloved pet? Maybe with their favorite toy, doing something silly or a great portrait? 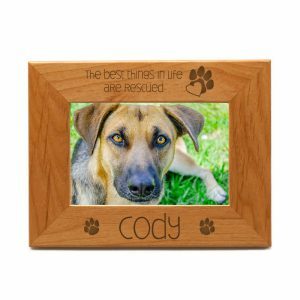 Display it in a classic Wooden Frame or this cute Dog Bone frame to always keep their memory around. Still have their favorite toy, leash or clothing? Store their precious items in a Memorial Box big enough to hold all of their favorite things and your special memories. 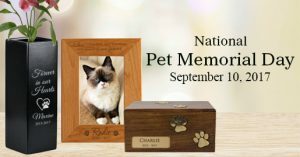 Hold a Memorial Ceremony – Give your pet a proper Memorial ceremony, invite friends and family over to say sweet things and remember the joy they brought. Reflect on silly and cute times or a moment your beloved pet helped you through a hard time. This ceremony could include planting a tree, creating a memory box or simply lighting a candle and is designed to bring closure after a loss. 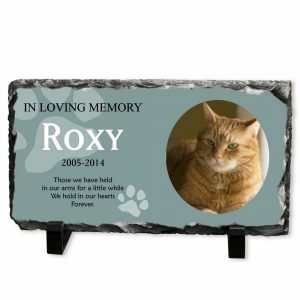 Memorial Headstone – Commemorate their grave site OR your special healing garden/ceremony with a special headstone. 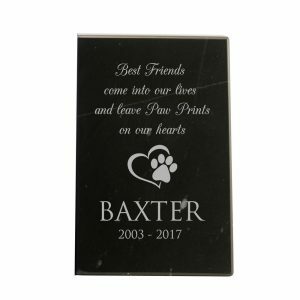 Dignified and classic, this Engraved Black Marble Stone is perfect headstone for your late pet. Suitable for your outside healing garden and classy enough to compliment any home décor. Losing a pet can be very devastating, unfortunately it only gets easier with time. We hope these ideas help you and your loved ones cope and heal. Make this year’s Pet Memorial Day a special one with one of these ideas. Have another idea? Let us know in the comments, we would love to hear your great ideas ways of celebrating this special holiday.